As we look forward to the Trials this weekend, I received a piece of bad news from long-time friend of Hepstrack.com – Marlon Mattis, father of the conference record holder in the discus throw and top seed in the USATF trials for the discus, Sam Mattis. Marlon told me that sometime last weekend, an important piece of Penn and Ivy League history was stolen from the Penn’s throwing facilities – Sam’s discus, the one he threw to set the Ivy League record and American Collegiate Record, and qualified Sam for the Olympic Games this past April. 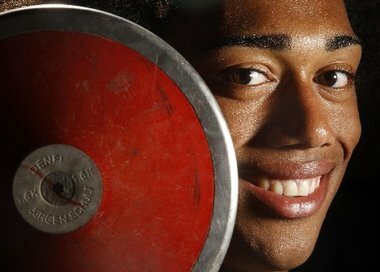 It was Sam’s favorite discus and hoped to bring it with him to Eugene when he competes next week for his berth on Team USA. The theft was discovered after the completion of the USATF Club National meet that was held at Franklin Field. Mattis’ discus was the only item not accounted for when they inspected the equipment shed it was stored in after the meet concluded, and Penn staff confirmed that it was in the shed prior to the meet. While the majority of the competitors that day were good, hard-working people, the Mattis’ family and Penn sporting staff feel that it may have been someone who was there for the meet who stole the implement from the locked equipment shed. “So, to the person who broke into the UPenn equipment shed and walked away with an iconic artifact of UPenn history I ask what was the point? The discus has ‘Sam Mattis’ written all over it. It has dates inscribed that go back to 2013 and speaks to a thrower’s personal journey. It has UPenn inscribed all over it. It speaks to an institution that means nothing to you but everything to the school and an athlete (and coaches and family who took that journey with him) who has made that tool fly, whirl sing and perform like it was an extension of his own body. Please spread the word and hopefully, Sam can get this discus back ASAP. “Last weekend the University of Pennsylvania put on a splendid Club meet that was sanctioned by the USATF. Many OT Trials hopefuls attended to give it one last shot to make the Trials and hence an opportunity to make the 2016 US Olympic team. The discus event had at least two great and honorable guys who were working as hard as they could to make the Trials. They put on a great show and one of them punched his ticket to Eugene. As a throwing community we were all excited and supportive of his achievement. Jeff’s final throw locked him in as the final accepted entrant for the Trials. You can’t ask for a better outcome than this for a great guy and up and coming coach. Jeff Milliron (Princeton’s throwing coach) and James Plummer (Rutgers ’13) are spectacular athletes and love the throwing community. We wish that all throwers were like these two guys. The majority of attending athletes are hard-working, classy and courteous people who respect not just their fellow competitors but other athletes who were there to give it everything they had to make the trip to Eugene. However, not all athletes are created equally and have the same respect for their fellow competitors. We discovered this terrible truth after the Club meet was over. Sam Mattis was not competing that day but he showed up to root on the other throwers. However, as the meet ended and the inevitable clean up began, the coaches and Penn throwers realized that an important artifact of UPenn Track and Field history was missing. The discus that was used to set the Ivy League and Heps all-time record was gone. The discus that was used to set a historic and improbable American Collegiate Record was gone. The discus that was used on two separate occasions to achieve the Olympic A standard at the UPenn facility and then again two weeks later to set a facility record at UVA, taking down the record set by the 2012 Olympic silver medalist Hassan Hedadi, was gone. Equally as heart-breaking is the fact that the discus that was to be counted on to launch an Ivy League Collegian into the top three of the Olympic Trials was gone. As any runner, pole vaulter, jumper or thrower will tell you; their favorite shoe, javelin, hammer, discus or shot is a friend to them. Once you lace up that shoe, kiss that javelin, hammer, shot or discus or speak to that favorite pole you know you are in good hands. You know that you have a friend that will not let you down. The tools are equally as important as your technique and effort. You can likely perform equally as well without these items on any given day. However, if they are missing the stress of performance increases, your concern about how the new tools will respond increases . . . you are put in a position of doubting the outcome based on having to dance with a new partner. It will most likely work out ok, but why should you have to endure such doubt during the most important event of your career. So, to the person who broke into the UPenn equipment shed and walked away with an iconic artifact of UPenn history I ask what was the point? The discus has ‘Sam Mattis’ written all over it. It has dates inscribed that go back to 2013 and speaks to a thrower’s personal journey. It has UPenn inscribed all over it. It speaks to an institution that means nothing to you but everything to the school and an athlete (and coaches and family who took that journey with him) who has made that tool fly, whirl sing and perform like it was an extension of his own body. If you have any decency, we ask you to return it to the school, its team and its coaches. It belongs home to the people who know how hard it is to become a National Champion. It belongs back to its home where a league understands how hard it is to be an American Collegiate Record holder. It belongs back to the one and only kid who can make it fly the way it deserves to fly. It belongs to Heps Nation!!! A Stradivarius only makes music if you know how to make it a part of you. The same is true of all the tools we use to achieve greatness. Do the right thing and return this discus! This entry was posted on Thursday, June 30th, 2016 at 5:55 pm. It is filed under Athletes, Spotlight. You can follow any responses to this entry through the RSS 2.0 feed.